Sorry to hear your news John. Good luck with your treatment. Following on from other posts, what about if John puts up a "Legacy" recipe & we all have a crack at brewing it & we send John a bottle to try/judge. It would save him brewing & who knows, might even brighten up his day chuckling at our efforts. Just a thought. Maybe Ben is performing there. Kelsey had it right, OS Stout tin, OS Dark Ale tin & 1kg of dextrose. I have made this a couple of times & I think it is pretty close to the Coopers Best Extra Stout in the stubbies with the yellow labels. Paddy, in your post you listed a stout tin & a dark malt extract tin, did you use these or the dark ale tin - they are different. Yep, our Majesty is famous, just ask him. Search "Fast Homebrew" on YouTube. Well worth a look. Anthony, I have to agree with you, drinking out of a pewter mug seems to hold a better head & stays colder for longer than a beer glass. I like to sample new brews from a glass so I can have a bit of a look at the colour, head etc. then after I'm happy with all that & hopefully received a few compliments from drinking partners it's back to a pewter mug. You are right, they were a standard birthday pressie back in the day (I have a couple that are showing their years now!) & have even won a couple at golf as well as a double walled pewter "Schooner". Congrats mate, great effort. At that pace you could slay the Indian Pacific Wheel Race in about 10 days!! Easy to brew Red Ale Recipe? 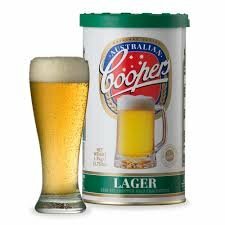 An easy kits & bits recipe I have brewed in the past is: 1.7kg Coopers Pale Ale Tin 1kg LDM 200g Caraaroma - steeped 50g Roasted Barley - steeped 22 litres I used the kit yeast as I that was all I had on hand at the time. I have used Nottingham Ale yeast as well. Turned out pretty well, may have to put down another one soon. Anybody here on CPAP therapy? SWMBO got worried about me when my snoring was only interrupted by me stopping breathing! I underwent the sleep test & was fitted with a CPAP machine. The first night I don't think the bride got any sleep, it was so quiet. I haven't snored now for 3 & a half years, except for the night our state was blacked out! I never thought I would get used to having a mask over my nose while I slept, now I can't go to sleep without it. No, sorry. I just stick to the vinegar and water mixture or washing up liquid. Never thought of using anything I use for brewing (sanitisers etc.). Umm....interesting topic given this is a Coopers forum. Yes, I used to drink Southwark Stout, about 30 years ago!! Coopers Best Extra Stout is now my stout of choice. If you have a look at the recipes section on this website there is a variety of Stout recipes for you to try at home. Another alternative recipe, which I have made a couple of times is the Toucan (two can) Stout. If you search on here you will find a thread on that brew. Stepping up to the next level - setting up a frementing fridge. If you have got any doubt with what you are doing regarding wiring the controller, get a sparky to do it. 240 volts can kill. I use Vanish NapiSan - "Sensitive" It doesn't have the scent etc. of the other laundry soakers. I have used it with no problems or noticeable residue/scent. After soaking, a quick hot rinse & the bottles are ready for sanitising prior to bottling. Of course the best way is to rinse the bottles out after emptying then store away - I use storage tubs with lids - so all you have to do is sanitise at bottling time. Come on Lusty, get with the programme!! This is exciting On a side and sad note, Eoin is now out of the race. He was hit by a car yesterday near Tarlee & was transferred to the Lyall McEwin Hospital. A report I heard was he sustained broken ribs & cuts & stratches. I was contemplating going out & riding with him & Ben as they came through. Hoping he has a speedy recovery.